This PDF 1.6 document has been generated by PScript5.dll Version 5.2.2 / Bullzip PDF Printer / www.bullzip.com / Freeware Edition (not registered), and has been sent on pdf-archive.com on 06/08/2017 at 04:57, from IP address 174.68.x.x. The current document download page has been viewed 439 times. File size: 1.4 MB (17 pages). 47. 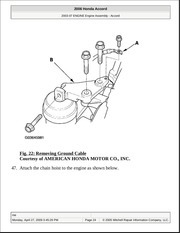 Attach the chain hoist to the engine as shown below. mount/bracket assembly (B) and clutch line clamp bracket (C). 52. Remove the rear mount stop (A), then remove the rear mount bolt (B). and coolant hoses, and electrical wiring. 55. Raise the engine/transmission assembly from under the vehicle. 1. Install the accessory brackets and tighten their bolts to the specified torques. remove the chain hoist from the engine. This file has been shared by a user of PDF Archive. Document ID: 00634759.